It’s 1:30 a.m. and we’re awakened by the sunlight peeking through a sliver of the window that remains uncovered by the dark curtains. We hear a team of sled dogs howling, increasing their pitch with every breath, until abruptly and mysteriously the chorus stops. A pesky mosquito is unrelenting, and we each consider turning on a light to begin the hunt, yet remain under the covers for fear of waking the other or suffering the insect’s sting. It’s just a few short weeks before the summer solstice, and we’re in the land of the midnight sun, Bethel, Alaska, a small town on the Kuskokwim River that functions as a hub for approximately 50 native villages in this remote, western territory of Central Yup’ik (see map). Central Alaskan Yup’ik is the largest of the state’s Native languages, both in the size of its population and the number of speakers. Of a total population of about 21,000 people, about 10,000 are speakers of the language. Children still grow up speaking Yup’ik as their first language in 17 of 68 Yup’ik villages, those mainly located on the lower Kuskokwim River, on Nelson Island, and along the coast between the Kuskokwim River and Nelson Island (Alaska Native Language Center, see websites, sidebar on p. 11). Many North American native languages such as Yup’ik are currently endangered and no longer being transmitted to all children. In the past decade there has been a rise in the number of Native American language immersion programs that aim to revitalize these endangered languages and support the bicultural identity of indigenous peoples. Months earlier we had been invited by Rene Contreras, Assistant Superintendent of the Yupiit School District in Akiachak, to come to Alaska to work with the teachers from three different Yup’ik language immersion programs. Hosting the week-long workshop (part of a three-week summer institute) was the first Early One-Way Yup’ik Immersion Program in the Lower Kuskokwim School District (LKSD), which began in 1995. 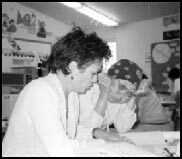 The two-classroom K-Grade 1 school building, where the workshop took place, is named Ayaprun Elitnaurvik, "Loddie Jones School," after the senior teacher in the program, representing the Yup’ik cultural value of honoring elders. Teachers from the Yupiit School District and Hooper Bay, boasting newer immersion programs, also participated. In all approximately 20 teachers and teacher assistants—all women—took part in the week-long workshop that wrapped up a three-week institute for Yup’ik immersion teachers. Ever-aware of the need to know the teaching context and the specific needs of the teachers with whom we would be working, we met with Chris Meier, who serves as co-principal along with Panigkaq Agatha John-Shields, and several veteran teachers of Ayaprun Elitnaurvik for initial discussion and planning. We had previously learned that curriculum development was the greatest perceived need, but soon became aware that issues related to status of the immersion language was a topic that also needed to be addressed. On the first day of the workshop, after being introduced to the teachers and learning a bit about the schools represented, we had groups create visual metaphors for "immersion education." We were delighted with the results, often stunned by the similarity in challenges we’ve found to be common to all immersion programs and amazed by the Yup’ik cultural references that permeated the metaphors. For example, one group claimed that "Immersion education is like berry-picking," a very important summer harvest in the Yup’ik world. In their metaphor, mosquitoes emerged as the sinister culprits in the community that try to undermine the efforts of immersion programs. Other metaphors included reference to the importance of the river, salmon, and the tundra in Yup’ik culture. Consistent with each of the metaphors, however, was the theme of forces within the society at large that made their work as immersion teachers all the more challenging. The Learners—L1 proficiencies, ethnic backgrounds, L2 proficiencies, developmental levels, and range of diversity in learning styles, learning disabilities, etc. The Learning Context—program model, relationship of individual classrooms within the broader program articulation, availability of materials and resources, including family and community resources and technology. The Theme around which the unit would be designed—a theme and topics to engage learners, content-related topics that could be integrated into the unit, and consideration of district grade-level curriculum and state/local standards. After some time thinking at the unit level, we had teachers hone in on one particular lesson that would be a part of the larger unit, and we took them through various stages for building a lesson that integrates language and content instruction. Teachers worked in groups, pairs, and individually in a variety of activities designed to help them to create meaningful performance tasks for assessing content knowledge and language use, to identify and write content, culture, and language objectives as well as to consider learning strategy instruction as part of the lesson, and to develop pre-, during-, and post-activities so that lessons would occur in phases. Each morning and afternoon session began with a teacher-directed "warm-up" activity, often an instructional technique or a song but at times a lively game like charades (we still chuckle at the memory of Elizabeth’s rendition of a rap singer!). We soon joined in the fun and shared songs and activities in French, Spanish, and German. We found these brief interludes to be powerful exercises; they relaxed the group and made us all laugh and gather strength for the hard work of curriculum planning to follow. Throughout the week each teacher worked on a lesson plan and received feedback through one-on-one conferencing with us and peers. We interjected work time with activities and information to enhance the lesson-planning process. During these curriculum development days we were reminded yet again of the intense effort that is required for effective lesson planning that provides for growth in language, culture and content. Ensuring that each activity sufficiently challenges the learner to move towards high standards, or teasing out the key vocabulary, grammatical structures and communicative functions that naturally emerge from the content objectives and the selected learning activities are difficult, time-consuming tasks. And yet, therein lies a key element of an immersion program’s potential for success. As one of the institute participants wrote in her daily journal, "Edit, revise, edit, revise, rewrite again and retype again. Type, type, type. I learn each time I retype, and go over my lesson plan" (Elizabeth Lake, June 14, 2002, personal communication). Would that the process were easier! The morning of the final day of the week, we chose to devote entirely to the all-important issues related to status of the immersion language and culture. Like most immersion programs in the US, the Yup’ik programs face the challenge of needing to elevate the status of the immersion language to compete with the powerful, high status of English. Getting students to choose to communicate in Yup’ik whenever possible in the classroom, restricting the amount of English spoken in the school during times when students are expected to use Yup’ik, and maintaining a print environment that communicates the importance of Yup’ik within the immersion school are some of the status-related challenges encountered by immersion programs. Issues related to status are even more pressing in programs where indigenous language revitalization is at stake (to read more about this issue, see Wilson, 1998). After eliciting these teachers’ experiences of the challenges, we had them work in groups to brainstorm ways to elevate the status of Yup’ik—in the classroom, the school, the family, and the community. The result was an energizing, enthusiastic discussion and the presentation of several lists of very do-able ideas for attending to the status of Yup’ik in the immersion programs (see sampling of brainstormed strategies below). One of the interesting issues to emerge from the group that brainstormed about the ways families can work to support immersion language status offers a glimpse into the complexity of Native American language immersion programs. Teachers in this group felt a need to further categorize their suggestions based on a representative range of home language proficiencies. Therefore, they came up with ideas for three different types of families: Literate Yup’ik-speaking, Non-Literate Yup’ik-speaking, and English-speaking families. Lunches were generous pot-lucks which allowed us to try many Yup’ik dishes: salmon prepared in more ways than we thought possible, Alaskan "ice cream" (a mixture of native tundra berries, whipped cream and shortening), caribou, and fish soup, to name a few. On the last day of our stay the principal treated the teachers and us with fresh halibut flown in from a coastal village and grilled in butter. The food was just a small part of our cultural introduction to the Yup’ik and this western area of Alaska. The teachers were eager to share their culture with us, and we were eager learners, curious and grateful for the experiences we were having. One afternoon we donned native Kuspuks (also spelled Qaspeq) and rubber boots to venture out onto the tundra with Abby, a first grade teacher. We explored many native plants, among them the all-important ayuq (labrador tea), used in many ways besides tea for its medicinal benefits. We then viewed videotapes of "potlatch" celebrations where Yup’ik children enjoy the community ritual of the "First Dance" in public. Our final evening we went with Barbara, an immersion parent-teacher liaison, and her family out onto the mighty Kuskokwim to fish for salmon with a 300-foot net. We were thrilled to see a dozen salmon pulled into the boat, with some kings weighing in at about 40 pounds each! 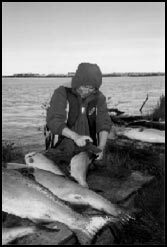 Watching Barbara clean them swiftly and expertly with the native uluaq knife at her family’s fish camp located on the river bank, we knew that we were in the presence of a master. Each evening, as we debriefed the day’s instructional and cultural activities, we remarked on how much we were learning from and with the teachers and how impressed we were by their genuineness. On the final day of our stay we enjoyed a party where there was a gift exchange among all the institute participants—we learned that gift-giving is very important in Yup’ik culture. This exchange was accompanied by explanations for the thoughts that went into the gifts. For example, one LKSD (Bethel) teacher bought toys and candy for a Hooper Bay teacher’s children because she knew how much she had been missing them during the three full weeks of the institute. The teachers contributed to a generous selection of gifts for each of us—from the native uluaq knife, to beautifully woven baskets hand-made by Loddie’s mother, to beaded earrings, and more. Then, to the sound of Loddie’s drum and the teachers’ singing, we learned some Yup’ik dances and entertained the teachers with our graceless hand movements and embarrassed laughter. Finally, as a perfect and meaningful end to the party and our week together, we all shared in round-robin fashion what we were thankful for. We thanked the teachers for their hard work, their laughter, and above all their genuineness. They smiled knowingly, and to our surprise, explained that Yup’ik means "real people." Indeed.